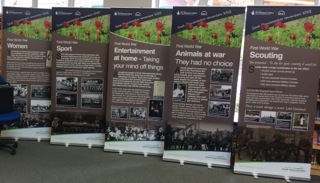 This new exhibition focuses on the social impact of the war in South Gloucestershire, displaying photographs and information about the war’s effects on local women, scouts and even animals, along with information about some of the entertainment and sport that was enjoyed at the time. Visitors will learn about the contribution made by the women left at home in South Gloucestershire, the local animals that were requisitioned and sent in to battle and there are pictures of local people entertaining themselves with theatre productions and concerts. There is also information about the 1st Downend scout group memorial, local sporting activities, and the fascinating story about the soldier who went through the entire war alongside his horse and then rode it all the way back to the UK from Russia. These displays include copies of original material from local organisations belonging to the South Gloucestershire Museums Group. As part of the exhibition, the library service has additionally recommended a range of books about the First World War (both fact and fiction) for adults and children, which are available to borrow through all South Gloucestershire libraries. The exhibition consists of eight light weight pull up banners. It is FREE to borrow.